Après la sortie des premiers mobis et la mise à jour de la vue aérienne, de nouveaux mobis vont bientôt être uploadés sur les serveurs de Sulake ! Même si nous n’avons pas encore les images de ces mobis, on peut déjà savoir qu’il y en aura deux types : le coté obscure et le coté lumineux. landing.view.mysticsroom.body=Who will prevail in this battle between good and evil? It’s time to decide… head to the Mystics room, to play your part! Score points to win badges and if you’re the top scorer of the week (checked on Monday) you can win a month of HC. But beware the warriors for good and evil may chase you at any time. landing.view.mysticscrystal.body=The crystal is taking over, it’s taking over the Mystics room. 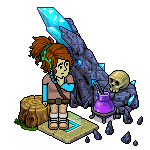 Whether your good or evil, think it’s time to figure out what’s causing this, head to the mystics rooom and get clicking on the crystal to earn achievements and find out what’s going on. landing.view.mysticscrystal.header=Where did that come from?